Awared in the FMCG category. 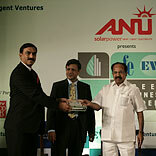 Tata Coffee was presented the FE-EVI ‘Green Business leader’ award in the FMCG category. Initiated and conducted by The Financial Express and Emergent Ventures India, the awards map the greening of corporate India and to felicitate green leaders. The Green Business Awards aims to recognise businesses and organisations in India which successfully operate with environmentally sustainable practices. Tata Coffee was felicitated under the FMCG category for its continued commitment and actions towards Bio diversity conservation and natural resources management. It has been acknowledged and admired as an excellent case where Biodiversity conservation is done in a way that it becomes profitable for the environment, society as well as for the company. Introduction of new crops, better utilisation of waste for augmenting soil fertility, efforts to conserve fauna habitat and involvement of the local community have been the key aspects of the Biodiversity conservation. Speaking on the occasion Hameed Huq, MD, Tata Coffee said, “Last year we were awarded the highest honor in the 'Low energy sector' category, and this year we have gone one step further, and bagged the title of ‘Green Business Leader’ in the FMCG category. Tata Coffee is committed to building sustainability and is constantly identifying opportunities for greening its business. It is important to realise that the task of environment protection is a universal responsibility of all."